Cai Yalin has won the second shooting gold medal at the Sydney 2000 Olympic Games for China and set an Olympic record in the process in the men's 10-metre air rifle final, Monday. Cai (696.4 points) qualified first for the final with a strong 594.0, and then blitzed the field to win by 1.3. 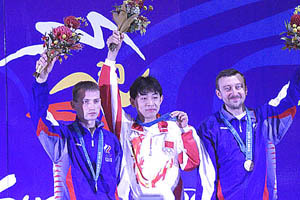 Russian shooters cleaned up the minor medals, with Artem Khadjibekov claiming the silver and Evgueni Aleinikov the bronze. Belarus's Anatoly Klimenko, the second-placed qualifier, was in the silver medal position with three shots to go, but faltered in scoring a 9.6 and 9.2 to finish fourth. The final began with Cai one-point ahead of Klimenko, the former Olympic record holder. A group of five shooters were a further one point behind, including finals world-record holder Jason Parker of the United States. The gold medal was always in Cai's keeping, however. Cai scored a 10.0 with his first shot to be 0.6 ahead of Klimenko and Khadjibekov, and then a 9.8, but that was the only chance he gave. He consistently hit high 10s to easily account for the field.